If you’ve installed even a few of the plugins we’ve covered here on this blog so far, then it’s likely the back end of your WordPress website is starting to look more than a little cluttered. While some developers are considerate enough to tuck the links to the configuration pages of their plugins away under the Settings or Tools menus on the admin sidebar, others choose to add the links to their plugin’s pages to the top level of the menu. As the number of plugins you’ve installed on your site grows, so too will the menus on the admin area of your website. This can not only make your virtual workspace look disorderly, but it can also make it difficult to find the pages you are looking for on the back end. Thankfully, there is a free plugin which can remedy this problem and allow you to reassert control over the unwieldy menu system that has grown on your website. By installing the Admin Menu Editor plugin you can now rearrange the menu system by moving items around, create new sub-menus to house related items that would otherwise be spread out all over the dashboard menus, and even add new items and links to the menus. If you feel like the admin menu on your WordPress website has become too unwieldy and you’d rather have a cleaner and more streamlined interface to manage your website through, then the Admin Menu Editor plugin gives you the tools you need. As the Admin Menu Editor plugin is free to use, it can be installed on your site directly from the WordPress plugin directory. From the Add Plugins screen, enter âAdmin Menu Editor’ in the search field and then install the first item listed in the results. Once the plugin has been installed and activated it can be accessed from the Menu Editor item hidden away neatly under the Settings menu. From the Menu Editor screen you can explore the current menu layout in place on your website. Through the interface you can move any of the menu items to new locations, simply by dragging and dropping them into place. The editor also allows you to rename any of the menu items and even change the target of the links to point to a new page within the WordPress admin area. You can just as easily create new menu items that link out to external pages. This could be useful if you wanted to link to helpful WordPress resources or pages your co-authors might find useful when submitting content to your website. If at any point you make a mistake and accidentally delete an important menu item, you can undo your changes or reload the default menu. 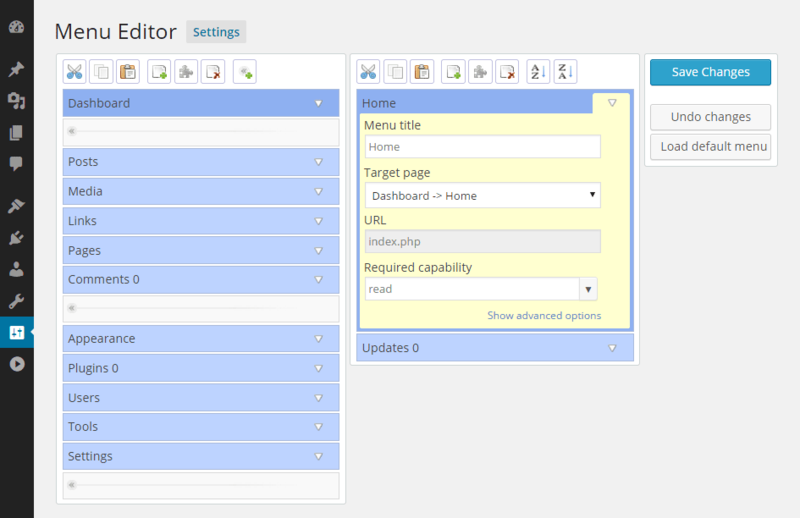 There is also a pro version of the Admin Menu Editor plugin which gives you a few more options to work with. This includes being able to import and export your custom menu configurations between websites. This would be handy if you are creating websites for clients and have a go-to menu set that you use on all sites. Other pro features allow you to create custom menus that are only accessible by certain users, as well as setting external links to open in the main WordPress admin area. The Admin Menu Editor plugin is a simple but effective tool that makes it easy to reorganize the admin menus so that you can remove some of the clutter and simplify the admin interface on your website. While the pro version does include some useful features, the free version is more than capable enough to let you take control over your website’s back end menu system. If you have any questions about this plugin, please share them in the comment below.